What Are Your Money Goals, Auntie? Take Time To Prepare Your Finances For The Future, Auntie! Consider exemptions and tax rates – during your life, or at death, you can transfer up to the exemption amount free of federal gift and estate taxes. If your taxable estate is equal to or less than the exemption and you have not already used any of the exemption on lifetime gifts, no federal estate tax will be due when you die. If it exceeds this amount, it will be subject to estate tax. The gift of giving – gifts you make during your lifetime, may be subject to federal gift tax. Take into account both estate and income tax consequences and the economic aspects of any gifts you would like to make. To minimize estate taxes, you should gift property that has not appreciated significantly since you have owned it, because your basis in the property generally carries over to the recipient, who will owe taxes on any gain when he or she sells it. For property that has declined in value, your best bet is to sell the property to take advantage of the tax loss. You may then gift the sale proceeds. If you are married, take advantage of the unlimited marital deduction and each spouse’s exemption – your estate generally can deduct the value of all assets that pass in a qualified manner – either outright or in trust – from you to your spouse during your lifetime or at your death, provided your spouse is a U.S. citizen. But if your combined estates are greater than the exemption amount, simply using the full marital deduction to avoid taxes on the first spouse’s death could result in needless tax liability on the surviving spouse’s death. A credit shelter trust can help minimize the estate tax by taking advantage of both spouses’ exemptions. Trust me! If you want to preserve some control over what happens to the transferred assets, trusts can provide significant tax savings. They serve a variety of purposes. For example, Qualified Terminable Interest Property (QTIP) trusts are good for benefiting first a surviving spouse and then children from a prior marriage. If you are a family business owner, transferring business ownership can preserve your business and accumulated wealth – if planned properly. There are tax breaks such as the family business estate tax deferral and valuation discounts. You could protect yourself with a well-structured buy-sell agreement. Gifting family business stock also can be an effective estate tax saving strategy. Take some time to think about the various gifts your family has, be it physical wealth, or strong emotional relationships. Taking the time to do some planning now can save a lot of stress later on. Stacy Francis is a nationally recognized financial and public relations expert, and is the founder of both Francis Financial, Inc. and Savvy Ladies. 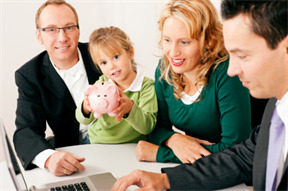 Home Expertise Take Time To Prepare Your Finances For The Future, Auntie!